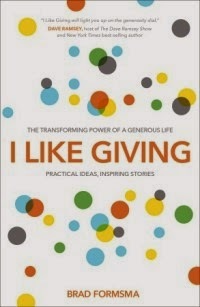 I LIKE GIVING by Brad Formsma is a book based on the website by the same name: ILikeGiving.com. Both the website and the book include many stories about GIVING, that help inspire all of us to make a difference in others lives - and how age or money does not need to limit us! I LIKE hearing inspiring stories. I LIKE receiving practical ideas on how to give to others. I LIKE listening to the Lord's prompting to help make a difference in someone's life. Pick up a copy of the book when you get a chance! I received my copy FREE from Blogging For Books for review purposes, and I have expressed my own opinions about it.